Myelin is the fatty, waxy covering that protects the nerves. It also helps nerves to do their job efficiently. It helps nerve impulses or signals from the brain move smoothly throughout the body's nervous system. When babies are born only a few parts of their brain are fully myelinated. that is why the baby cannot control their arms and legs. One part, the motor cortex, is the part that controls sucking which of course babies need right away. The process continues as the baby's vision, hearing, language, and physical abilities continue to develop. Believe it or not, your brain continues this process all the way into your mid-twenties. From the age of ten to the twenties, there is a great amount of fine tuning going on in your brain. During this time of your life, your brain actually "prunes" itself. Connections that are used get stronger. Any connections that are not used are pruned or eliminated. What you end up with is a very efficient brain, that works effectively, all based on the environment you grew up in and each and every one of your experiences. The fatty nerve covering is produced by two different types of cells. 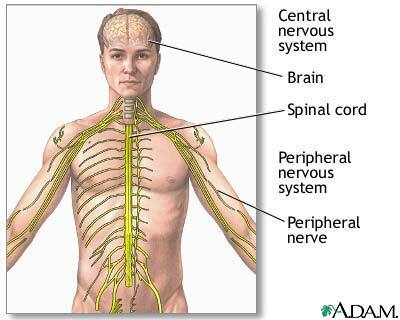 In the peripheral nervous system, it is produced by Schwann cells. In the central nervous system, (CNS) it is produced by oligodendrocytes. Each oligodendrocyte can produce this protective covering for several axons at a time. Have you ever heard the term "white matter" of the brain? This refers to the waxing covering of the axons. The white matter is made up of about 80% lipids or fats and 20% proteins. The layer of proteins is between two layers of lipids. The sheath wraps around the axon. The axons are the threadlike extensions that make up the nerve fiber. When the sheath becomes damaged, the signals will either be slowed down or stopped altogether. In the case of multiple sclerosis, the damage causes inflammation or scars along the sheath. The scars show up as spots on an MRI. The effects of the damage are the symptoms you have when you're diagnosed with multiple sclerosis. If you've ever had an appliance where the electrical cord has worn out, then you have a simple explanation to help you understand how the nervous system works. The thick covering around the electrical wires inside, helps keep the signal moving smoothly along. If the cord becomes worn in different places, the current is then interrupted or shorts out. The current no longer moves smoothly from outlet to appliance. The cord needs to be repaired or replaced in order for your lamp or appliance to work correctly. The Myelin Project is a site that is searching for a way to cure diseases like multiple sclerosis. Their theory is that since demyelination causes the damage, regrowing the fatty covering of the nerves will ultimately fix the problem. Makes sense to me. What about you? The founders of the project are working hard to put themselves out of business. Here's a video about them.